The hunt for the perfect wedding dress is an exciting time. You’re bound to flip through many a bridal magazine page as well as various websites in the hope of finding some much-needed inspiration. In the process you may find yourself overwhelmed and burnt out, perhaps, at the number of options that are available. Many women find that the picture they have in their head of their ideal wedding dress often does not directly translate to anything they’ve scoured through, be it online, in magazines, or the countless shops they’ve stumbled across. 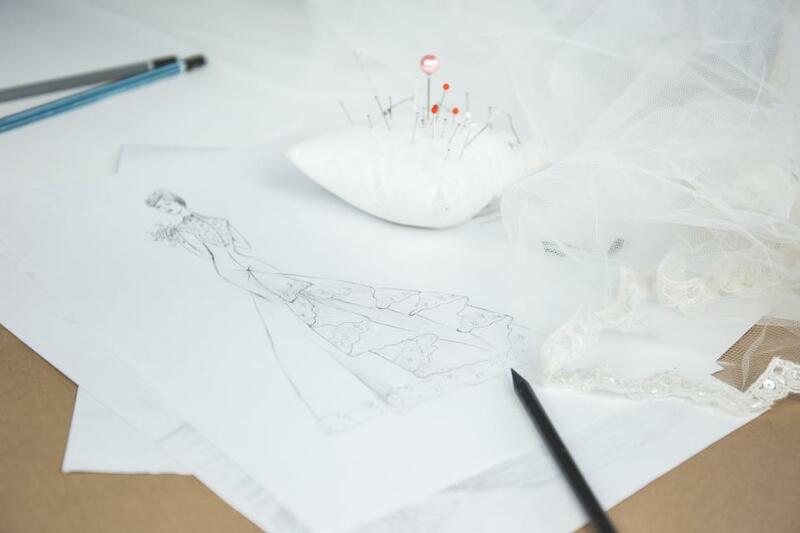 Ask any individual working in fashion, from the world’s most renowned in the bridal industry, Vera Wang – the ultimate wedding dress designer, to your local seamstress, and they will tell you that the scour for the “it” dress is painstakingly time-consuming. Below is a step-by-step guideline for the bride-to-be who is on the hunt for a unique, custom-made dress. The first step to consider in this unique and highly individual process is the basic shape which your dress should take. There various shapes when it comes to wedding gowns, and it is vital to have a somewhat clear idea of the shape you are after, and one which ultimately works well and accentuates positive aspects of your body shape. When choosing the right style and fit, it is advisable to first try on as many ready-made gowns as possible at the shops, so as to deem which bring out your form in the best way possible. After trying on the dresses, it is a good idea to make sure that you have taken detailed notes about any particular features in the dress designs that best suit your tastes. The dress designs which strike you are going to be the references that you show to your designer when the time comes. Secondly, it is important to find an artist with a rich repertoire, who knows his way round wedding dresses, and someone who can adapt to the dress of your dreams. Most importantly, the person has to be easy to communicate with and accepting of your ideas. The last thing you want when searching for a designer is one not to be eager to lend an ear when you are communicating your likes and interests in dresses. A situation like that is bound to spell disaster right when you don’t need it. Lastly, even if the wedding budget is tight, you do not necessarily have to resort to the designer charging the lowest prices. While it is important to adhere to the budget, you need to make sure you share a connection with your designer and a passion for the dream dress. It is possible to stick to your budget by simplifying more elaborate details to the dress and modifying it to suit your needs, such as using a different mixture of fabrics in particular areas, namely polyester in place of silk, so as to help reduce the overall costs of the dress.